BURNET, Texas (Aug. 29) – Taking a break from the campaign, let me offer an idea for consideration by local Libertarian Party affiliates. I offer this not as a Wrights 2012 campaign initiative, but simply as something that has been successfully used by Libertarian Party groups for promoting libertarian ideals. Not all Libertarian Party activism needs to be political actions or campaign activities. Often we can more easily and more effectively promote the libertarian message of individual liberty and personal responsibility by simply being good citizens and participating in civic action. Case in point: About a decade ago I had the great honor of penning a resolution in honor of U.S. Constitution Day for the Libertarian Party of Forsyth County (N.C.), which we worked to get adopted by our local government bodies. While the resolution was presented by the Forsyth LP, it was not part of any candidate’s campaign, or intended to make any political point. We simply offered it as a group of concerned citizens called the Forsyth Libertarian Party. Local governing bodies pass resolutions proposed by all sorts of groups in honor of all sorts of things all the time. To our delight, the resolution was passed and adopted by the town council. Building on our success, we decided to encourage other Libertarian affiliates in the state, and across the nation, to sponsor a similar resolution in their local towns and counties. What began as a local action quickly grew into a national movement and I am proud to report that the U.S. Constitution Resolution was eventually adopted by local governments in nearly half the states in the union, and that the project has been repeated year after year. One of the best reasons for this project is that it is an excellent opportunity for libertarian organizations at the grassroots level to do something positive. 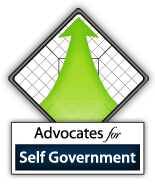 All too often libertarians are perceived as being “against” one thing or the other; even worse, we are sometimes accused of being against “everything.” This resolution gives us the opportunity to bring something before governmental officials that we favor. It gives us the chance to show communities all across American that libertarians are actually “for” something. Another reason for undertaking this effort is that is far easier than you think get this resolution accepted by local governing boards. After all, what self-respecting politician would vote against recognizing the U.S. Constitution in an open meeting? Not one, to my knowledge, has ever voted against it once it was under consideration by the board to which they belonged. If you can get one board member to offer the resolution for consideration, you are virtually guaranteed passage. While it is a shame that we should even have to propose a resolution such as this, it is encouraging to see the idea so widely embraced. We need to continue to educate our fellow citizens about our beloved Constitution and highlight the many and sundry ways it is being tread upon every day by those in whom they have placed so much trust. U.S. Constitution Day or Week should need no proclamation. It should automatically be a national holiday and be every bit as celebrated as most of the other holidays combined. Only education will save the republic that our Constitution preserves, and gain the respect for the document that it so richly deserves. We urge all Libertarian affiliates to ask their local government bodies to adopt it for the 224th anniversary of the U.S. Constitution, Sept. 17, 2011. Below is the text of the resolution. Please feel free to copy, edit, rewrite or adapt the resolution to fit your local situation. Check with your local school district to find out when they will be marking Constitution Week and fill in the dates to match. The official dates are usually set in a Presidential proclamation, but that may not be issued until a few days before Sept. 17. Then, let’s us know what kind of luck you have getting it adopted. This can also be an outstanding outreach opportunity to distribute copies of the Cato Institute’s Pocket Constitution (buy copies in bulk for $1 here) at any meetings where the resolution is considered. Be sure to stamp your local Libertarian Party affiliate information on the inside cover, and personally hand copies to each member of the governing body, during the meeting if possible. Never be afraid to let people know that Libertarians support the U.S. Constitution! WHEREAS, September 17th is designated as U.S. Constitution Day, and that September ___ through September __ is designated as U.S. Constitution Week throughout the United States of America. NOW, THEREFORE, BE IT RESOLVED that the __________________ of _________________ hereby declare the official observance of September 17, 2011 as U.S. Constitution Day, and September __, through September __, 2011 as U.S. Constitution Week in _____________, in humble respect for the patriots from our past that gave their all so that their fellow citizens, and those yet unborn in our nation, should remain free in perpetuity to enjoy the rights of Life, Liberty, and the Pursuit of Happiness.